Today, Apple has released iOS 5 Beta 5 (build 9A5288d) to members of the iOS developer program. This update brings some fixes, but no new major features were added, according to the release notes posted by BGR. 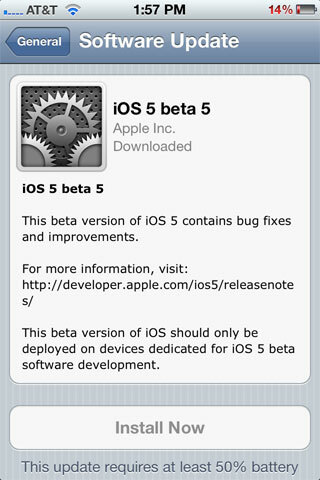 As the previous release of iOS 5 beta 4, you can update from iOS beta 4 to beta 5 using the over-the-air-update feature. To install iOS 5 Beta 5 using over-the-air update, you must erase all content and settings on your device by going to Settings > General > Reset > Erase All Content and Settings, as mentioned in the release notes. Apple released iOS Beta 4 about two weeks ago enabling over the air software update for the first time. From there, we found out that over-the-air software updates are less smaller than regular updates through iTunes, making the update download faster.